Toronto Land Transfer Tax — What’s New and What’s Coming? - Distinctive Advisors Inc.
2016 was a big year for changes in the Canadian Real Estate Market. On the heels of the announcement in October regarding changes in the mortgage underwriting rules for first time home buyers (ultimately reducing the buying power of first-time home buyers in Canada, read more here), the province announced changes to provincial land transfer tax which are aimed at helping increase affordability for first time home buyers, effective January 1, 2017. Ultimately these changes are expected to have negative implications on transactions over $2 Million which, in the City of Toronto, represents a large part of the real estate market for centrally-located detached homes. 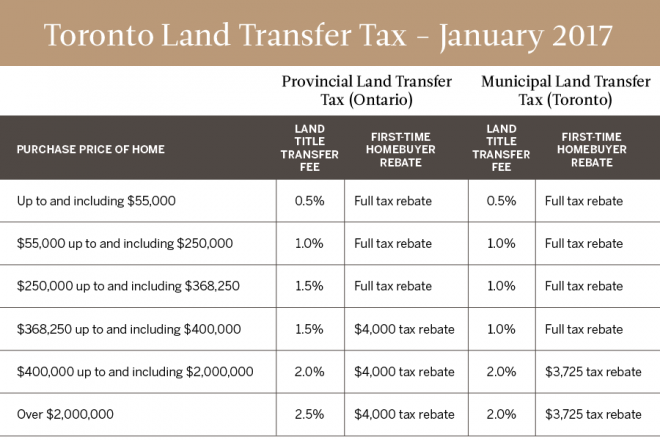 But Toronto is unique in that, unlike all other municipalities in Ontario, it has a municipal land transfer tax in addition to the provincial land transfer tax. The City of Toronto is currently exploring raising the Municipal Land Transfer Tax in order to meet 2017 budget objectives. The effect would be an additional 0.5 per cent of tax on all buyers. This could mean a seven per cent increase of $750 on top of the $11,000 for an average priced home purchased by a repeat buyer in Toronto. Toronto Real Estate Board has launched a website to combat the City on the increase of land transfer tax. Toronto City Council will finalize its budget in February 2017. Would you like to be kept informed on the latest in Toronto Real Estate? Contact a member of our team to be kept in the loop or sign up for our monthly real estate updates today.